In 1985 an angler caught a 97.25-pounder, still the world’s record. Next post: One couple is finishing a velociraptor with a blowtorch. Fishing was the one constant during these years. Sensing in it a masculine, character-building quality my mother arranged it so that the cottages we rented always had access to streams and lakes or abutted other properties we could trespass upon that had such resources. She trusted my instincts for spotting fishy water and used me as a kind of diving rod before signing a lease. And for most of my childhood, we were within a short walk of a potentially fruitful cast. The book is divided into an examination of the title four fish, salmon, tuna, bass and cod. You’ll never look at sushi again the same way. I’ve been an eyewitness to the Alaskan salmon fishery my whole life, and as I was reading this book I was thinking about the Kenai River king salmon. In 1985 an angler caught a 97.25-pounder, still the world’s record. 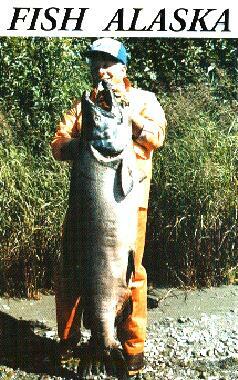 In 2013 the Kenai River was closed to king fishing because of low escapement. He ends on a pretty convincingly optimistic note, I’ll give him that. I hope he’s right. And I wish everyone fishing on and beyond the Kenai River, the setnetters, the drifters, the seiners, the anglers and the subsistence fishermen, would read this book. Maybe they could stop fighting over their share of the run and start working together to save it.